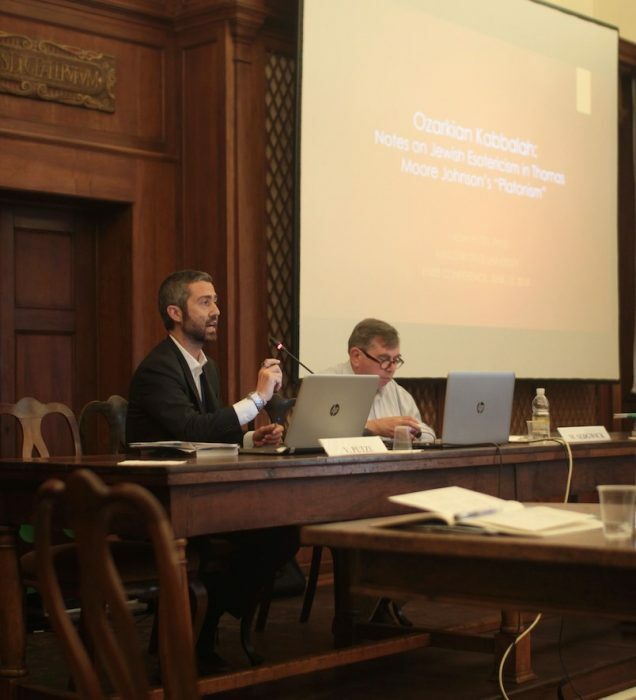 Dr. Vadim Putzu brought a taste of the Ozarks to the conference table in Italy this summer, presenting his research on the nature and place of Kabbalah in the writings of Thomas Moore Johnson of Osceola, MO. Dr. Vadim Putzu, Assistant Professor in Religious Studies at Missouri State University, brought a taste of the Ozarks to the conference table in Italy this summer, presenting his research on the nature and place of Kabbalah in the writings of Thomas Moore Johnson of Osceola, MO. Thomas Moore Johnson (1851-1919), was an American attorney and student of philosophy. Known as the “Missouri Platonist,” he lived in Osceola, MO and published The Platonist. In 1875, he became one of the first members of the Theosophical Society, founded by Helena Petrovna Blavatsky and Henry Steel Olcott (TheosophyWiki).